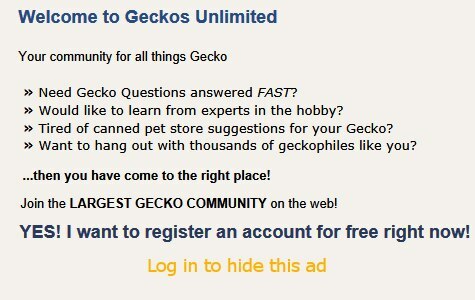 I wanted to get a lid for my Leopard geckos terrarium but then I saw the price lol. I decided to make my own. Will this work? Last edited by EchoTheLeopardGecko; 04-15-2019 at 06:41 PM. If it stays on and no animal (or little sister) can get into it, and it gives enough ventilation it should be OK. The only thing I'd really worry about is ventilation because if the lid is solid aluminum foil, there's not much airflow. If that's the case, go to Home Depot or some other hardware type store and get a roll of vinyl mesh --the kind that goes in screens. It's pretty cheap. Cut a piece the correct size and replace the aluminum foil (which is going to tear eventually anyway) with that. Thanks for the reply! The tank is too high for little hands to get into and I left one third of the tank lid without aluminum foil. I believe that should be enough of an opening right? If not then I will be headed to Home Depot soon! Thanks again! No offense but the majority of the time you get what you pay for. You would likely be devastated to have your little one escape never to be found again. They are very good at climbing the simplest things in order to escape. You need something much more secure which they cannot push out. He’s an example I found once on you tube. Little sisters grow bigger quickly. The bigger she is, the more creative she'll get. "Now let's move a stool or chair closer. Then I'll be able to reach that lizard!" How about building a wooden frame that also has ~2 inch sides so it's more escape-proof and can't be knocked off? Then cover the entire top with hardware cloth. It may be cheaper just to buy a screen top.